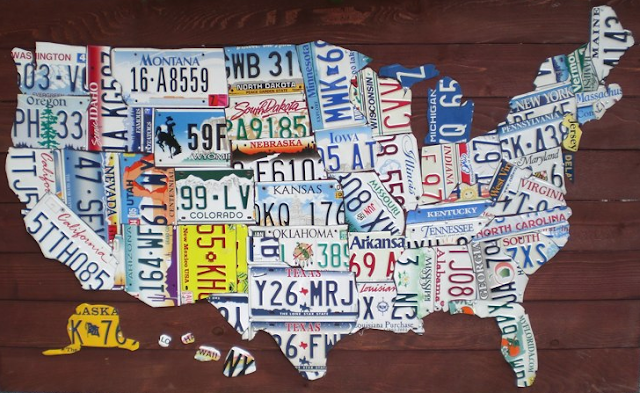 I am loving this map of the United States, created entirely of license plates. Have you ever seen anything remotely similar? I haven't. I think it's clever, clever, clever. Check out your local state...it really does resemble its true outline, no? This is the perfect art for a recreation room, a man's office, or any other space that needs a little hip-ifying. Oh yes - they have a canvas painting just like this at Target for $40. It's lovely - and cheaper. Though undoubtedly not made in the USA. Tough call. But I just wanted to speak out and say yes - I've seen it. Very cool idea. urban outfitters has one of these for THOUSANDS of dollars (like $3000 or something) but Target has one for cheaper. Oh, somebody already said that. nevermind. and I'm from NM and have always loved the bright yellow plates from there. They really stand out on that map! Aaron Foster had the original idea and made these license plate "maps" famous (you may have seen Aaron on HGTV and elsewhere). His versions are amazing and yes, they do sell for a LOT of moola. I think the Sundance catalog carries one occasionally. And I believe Aaron still has his own website. Anyway, just FYI - and because I've always thought they were way cool.